Logistics is widely known as the process of coordinating and moving resources such as equipment, food, liquids, inventory, materials and people from one location to the storage of the desired destination. It was originally a military-based term that was used to describe how the military force obtained, stored and moved equipment and supplies. In the supply chain and business sense, logistics is the management of the flow of things between the point of origin and consumption, so to fulfil the requirements of consumers or corporations. The logistics of the aforementioned resources involve the integration of production, packaging, warehousing, transportation, security, materials handling and information flow. Logistics management focuses on the efficiency and effective management of daily activities concerning the production of the company’s finished goods and services. This type of management forms part of supply chain management and plans, implements and controls the efficient, effective forward, and reverse flow and storage of goods. This process, as mentioned, happens between the point of origin and the point of consumption in order to meet requirements set by customers. The main aim of logistics management is to allocate the right amount of a resource or input at the right time. It is also ensuring that it gets to the set location in a proper condition while delivering it to the correct internal or external customer. Effective supply chain and logistical procedures are important as they reduce costs and maintain & increase productivity. Substandard logistics on the other hand lead to late deliveries, failure to meet consumer requirements and in the end, ultimately causing the business to crumble. Consumers consistently demand better service, and this has prompted supply chain role players to aim to provide fast, accurate and quality service. Logistics management is responsible for making certain that this aim materializes, and that customer satisfaction is established. Logistics management is also crucial for creating visibility into any company’s supply chain. As historical data is analyzed and the movement of goods is tracked in real-time by advanced transportation management systems (TMS), logistics uses this information for process optimization and the avoidance of potential disruptions. Additionally, supply chain visibility creates ground for major cost savings in operations. Proper logistics management procedures increase revenue and give businesses control over inbound freight; allow for the organization of the reverse flow of goods; keep inventory at optimal levels; and utilize freight moves on the proper transportation modes. These factors all contribute to cutting costs. The concept of business logistics has been said to have transformed since the 1960s. As the need to supply companies with materials and resources grew over the years, so did the global expansion of supply chains along with specialists who grew in their niche & skills. Moving further into the modern era as well, the complexity of logistics processes have inspired the creation of logistics management software and have launched businesses that focus solely on accelerating the movement of resource along the supply chain. Manufacturing companies have even gotten to a point where they choose to outsource the management of their logistics to specialists; a field that is dominated by Third Party Logistics (3PLs) providers. 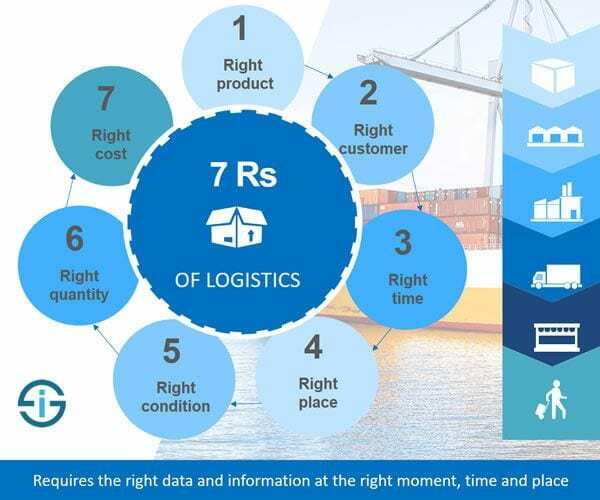 Furthermore, being the in the thick of the digital era too, the logistics and supply chain industry has caught up and has taken strides towards digitizing internal and external processes. As mentioned in our The State Of Today’s Competitive Supply Chain: Digital, Smaller and More Resilient article, 90% of the supply chain execution expenditure will be in support of logistics digital applications and software by 2020. The IoT has already started allowing companies to digitally connect physical assets and enable flow of data across the value chain, linking every piece of the product lifestyle. Digitized supply chains have also given customers insight and transparency into the logistics process where they have been allowed feedback into their transactions. Every user now feels like they are in control of the process, eventually leading to consumer satisfaction; a factor every business should be striving for. Technology has offered numerous benefits and opportunities when it comes to the supply chain and logistics field and these include advanced data analytics, ease of scalability, data security, cost saving, integration of multiple platforms, real-time tracking and automated procedures. When speaking of logistics management joining forces with technology, software leads the conversation because logistics processes cannot be highly optimized without the appropriate software systems. Logistics Management Software aims to plan, implement, and control the flow and storage of goods, services, and related information. It optimizes this process, allowing for a larger bottom line through an increase in automation, visibility, communication and process efficiencies. Supply management deals with the planning and coordination of materials needed in a specific location at a specific time in order to provide support to production or activity. Supply logistics must have transportation of the materials and storage along with plans in place for evaluating the level of supply during different stages of the process; making sure that the flow of materials aligns with the need. Distribution is about managing how a supplied and stored material is then sent out to the locations where it is needed. The process includes issuing of material movement (loading, unloading and transportation), tracking of stock, and accountability of use (noting down how the supply is used and by whom). This type of logistics management oversees the stages of combining distributed supplies into a product. This can entail coordination of a manufacturing or assembling process and in the case of applications such as military production, the logistics of coordinating space and areas for production to take place. In construction, production logistics will include the staging of material to coordinate with the phase of building taking place. Reverse logistics management handles the recalling of material and supplies from a production of assembly process. In the logistics management of a construction project for example, reverse logistics plans for the removal of excess material and re-absorption of the material into a stock supply. See the Leading 6 Online Logistics Courses For Aspiring Logistics Professionals. Dovetail Business Solutions. 2017. Today’s Competitive Supply Chain: Digital, Smaller & More Resilient. [ONLINE] Available at: https://www.dovetail.co.za/state-todays-competitive-supply-chain-digital-smaller-resilient/ . [Accessed 07 September 2018]. Investopedia. 2018. Logistics. [ONLINE] Available at: https://www.investopedia.com/terms/l/logistics.asp . [Accessed 10 September 2018]. PLS Logistics. 2018. Why is Logistics Management Important?. [ONLINE] Available at: http://info.plslogistics.com/blog/why-is-logistics-management-important . [Accessed 07 September 2018]. Tribe, C. Bizfluent. 2018. Difference Between Different Types of Logistics Management | Bizfluent. [ONLINE]. Available at: https://bizfluent.com/info-8537818-differences-different-types-logistics-management.html . [Accessed 10 September 2018].